The Stoics were not interested just in ethics, even though that was the crucial aspect of their very practical philosophy. In going through the various chapters of the Cambridge Companion to the Stoics, we have looked at aspects of their “logic,” including moral psychology and logic proper; and our explorations of their “physics” has led us through discussions of natural philosophy and more recently of medicine. Today is the turn of Stoic astronomy. The corresponding chapter in the Cambridge collection is authored by Alexander Jones, which begins with an overview of Greek, and particularly Hellenistic, astronomy, especially centered around Eudoxus’ model of a celestial sphere surrounding a stationary Earth. The model also accounted for the movement of the Sun and the planets by hypothesizing a number of additional, invisible, rotating spheres. It is important to note that already by the II century BCE Eudoxus’ system was known to be inadequate to explain actual astronomical phenomena. What about the Stoics? Zeno, the founder of the philosophy, wrote a book called On the Whole, in which he explained solar and lunar eclipses respectively as due to the passing of the Moon between Earth and the Sun and the Moon’s traversing the shadow projected by the Earth. Strike two points for the Stoa. But then again strike one against it because of Cleanthes rejection of Aristarchus’ conjecture that it is the Earth that moves around the Sun, and not vice versa. Cleanthes went so far as to make the very un-Stoic (in my mind) suggestion that the authorities should prosecute Aristarchus for impiety! According to Jones, a systematic presentation of Stoic astronomy is found in Cleomedes’ Kyklikê Theôria Meteôrôn (“Theory, involving circles, of the things in the heavens”), which builds on, and yet differs from, Aristotle’s physics. According to Cleomedes, the cosmos is made of a finite sphere contained in an infinite void. The Earth is at the center of it, surrounded by water, air and then aether. 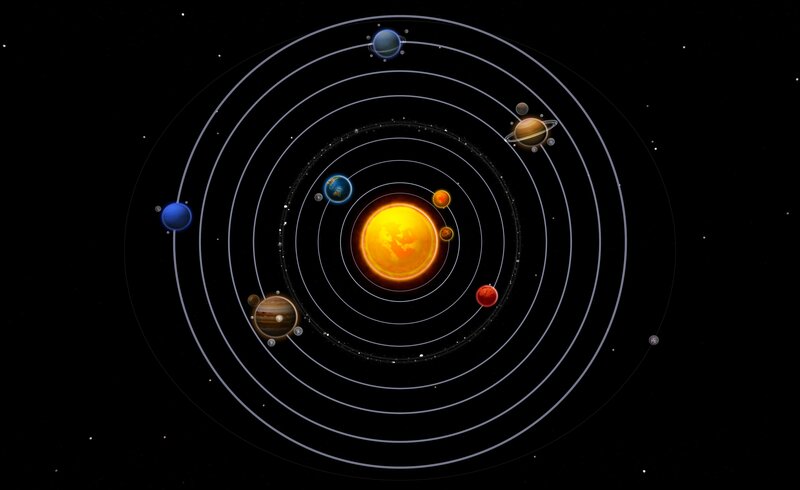 Outside all of this are the planets, each revolving according to its own motion. Cleomedes sharply criticized Epicurus, for instance for the latter’s idea that the Sun is really only “as big as it appears” (about a foot in diameter), but even his estimates are crude by comparison to what had already been produced by Aristarchus and Hipparchus (the latter had arrived at a figure for the distance between the Moon and the Earth, using two different methods, within 30% and 17% of the actual one). So, even though the Stoics were concerned with astronomy, their opinions — just like the ones they held on medicine — were not exactly cutting edge. From a modern standpoint, however, what is more puzzling is the Stoics’ interest in astrology. Then again, Jones is very careful in disentangling several meanings of the term for the ancients: i) the Greek tradition of correlating weather and seasonal patterns with changes in the heavens; ii) the Near Eastern take, which was concerned with the interpretation of omens; and iii) the Hellenistic and Roman approach of making predictions based on the instantaneous position of heavenly bodies. Cicero tells us that Panaetius was skeptical about astral omens, but also that he was rather exceptional among the Stoics. Tacitus, for his part, says that the Stoics were skeptical about so-called astrological determinism: fate (or universal cause and effect) does determine everything that happens, but astrologers are not thereby capable of making reliable predictions based on their charts. It’s also worth noting that later Roman Stoics hardly mention astrology at all. It is interesting, finally, to comment briefly on Stoic geography. Here the two major authors are Posidonius and Strabo. Posidonius was interested in, and conceived of, the earth very much as a physical, not just a geometric, system, and was concerned with very modern topics, such as climatic zones, tides, seasons, etc..
Strabo was more cautious about speculating about the causes of geographical phenomena, since their causes are “hidden,” thereby posing strict epistemic limits to what one can say with confidence, given the status of knowledge at the time. Second, I find it challenging for a modern mind that the Stoics thought of all knowledge — including that of their “physics” (i.e., natural science and metaphysics) and their “logic” (i.e., logic, epistemology and cognitive science) — as valuable not in its own right, but because it served ethics, the study of how to live one’s life. As a modern scientist who has spent decades investigating basic questions in biology, with no clear connection to practicalities and the betterment of humanity, I have always taken for granted that of course curiosity for curiosity’s sake ought to be encouraged and, most importantly, funded at the tune of billions of dollars annually. But I’m not so sure anymore. More and more I find the Stoic challenge compelling: we are here now, and we have huge problems to solve. Why shouldn’t all our efforts and resources be devoted to use our ingenuity in order to improve our condition? I don’t think there are easy answers to be had, besides platitudes about the “long term” usefulness of basic science, which more and more sound like self-serving rationalizations to my mind. It seems to me an open and rather urgent question in modern society. This entry was posted in Ancient Stoicism, Science on January 14, 2016 by Massimo. An excellent question… Should only streams of Science that deal with the big issues of disease, climate change, food shortages, etc. be studied and researched? I think as Stoic students the only thing we can do is try to guide our lives with the purpose of serving our fellow “man” in some beneficial way. There are many cogs in the clockwork along with springs and “sprockets”. Many times we are unaware of how our little effort actually makes a difference to the big picture. I try to have the right motivations in life as my goal and hope that my little spring makes a difference. There is also the ‘knowledge is power’ ethic that drives a lot of science, especially those connected to the military-industrial complex. I believe Francis Bacon invented that since I don’t recall seeing it in Greco-Roman Philosophy. Let’s not forget that a lot of modern science is funded for financial and not purely scientific interest, and that this brings with it its own potential for bias. For example, the pharmaceutical industry is responsible for much of the medical research in the world and it isn’t doing it for humanitarian reasons, despite what it might claim. It just so happens that this research is accidentally also beneficial to humanity. There have been some research studies which have later been found fraudulent, so this benefit is not necessarily guaranteed. Likewise, ancient philosophers had their own biases in science, believing their epistemology was as good to explain physics as ethics, even when we know there is no connection. While I can concede that science and logic can certainly answer ethical questions and even provide a framework, to me, human ethics are for humans while other sciences apply to other things. I can’t imagine, no offense Massimo, to be able to draw any inferences on ethics from knowledge of botany. In summary, bias is everywhere and so while philosophy has its bias there are also other biases, such as financial, which always call for vigilance. A Stoic will suffer the pain of considering a seemingly-unsolvable problem if its resolution is their duty. Who decides what the duty of the Stoic is? Their conscience, it seems to me. If one’s conscience calls for them to engage in more direct actions for the benefit of humanity, would it be wise to ignore these calls? None taken! Even though as a scientist I did do research on plants! Great article. The Cambridge Companion is hands down one of my favorite books written of the Stoa. One thing that caught my eye when I had read it was a passage (pg142, Stoic Natural Philosophy) from Nemesius’ On the Nature of Man. The very idea that ancient philosophers had carried the concept of a conflagration or ‘doomsday’ is vexing enough, especially when one considers that, above all else, the Sun has never once failed to set, and the Moon has never once failed to rise. The conflagration, from our modern perspective looking back, has zero supporting evidence. Mankind could never have witnessed the birth or destruction of our world, or at least not the level of destruction afforded to the conflagration. So, how could a logically-inclined individual possibly come to the conclusion that the only thing (from our modern perspective) that has happened throughout history, with unmatched reliability, consistency and regularity, suddenly succumb to the cleansing fires of the heavens? By definition, it’s something they could not possibly know to exist (the strict epistemological limits you mentioned are quite applicable to this topic). Unless, of course, mankind actually had witnessed these cleansing fires..
To my point, I believe there is evidence in the astronomical works of the oldest Stoics (or in Zeno’s case, what has been written of his works), and possibly a great many other ancient cultures, that lend credence to these heaven-borne fires of rebirth. What would lead the Stoics to believe that the stars would ever need to return to their original positions, much less inclination, declination, and starting point? Stellar procession is far too slow to have been witnessed, and we’re certain (from our modern perspective) the heavenly bodies are in the same position today as they were in 300 BCE.. Right? What would be your logical take on the belief of the conflagration? As well, what would be your logical take on the Stoic belief that the planets and stars are observed to have somehow deviated from their original inclination, declination, and starting point?